Our 2019 kid crop is here! Wethers are weaned at 10 weeks, bucklings at 12 weeks and doelings at 14 weeks old. All kids are sold current with CD/T vaccine, worming and hoof trim. Kids will not leave the farm prior to weaning, with the exception of a special or emergency situation. We breed for hardiness, easy keeping, strong maternal traits and healthy rate-of-gain. ﻿ We are also working on developing a more parasite-resistant goat by worming only when needed using the FAMACHA System as a guide. Please contact us if you are looking for a quality Boer or Savanna/Boer doe for your 4H Breeding Project or a doe for your 4-H Breeding Project. Please visit our "Sale: Bucks" and "Sale: Doe/Doelings" pages for kids currently available. These page will be updated as more kids become available. Commercial meat wethers $100 at weaning, $2.50 per pound live weight after 20 weeks old. All kids are sold either registered or with application for registration, unless otherwise noted. If sold as breeding stock, they will be top-quality and have the desirable traits we would use in our own breeding program. We do not sell culls as breeding stock. If you are interested in a "pet" or "weed eater" goat, please let us know and we may have the just the right one for you! We are members in good standing with the American Boer Goat Association (ABGA). 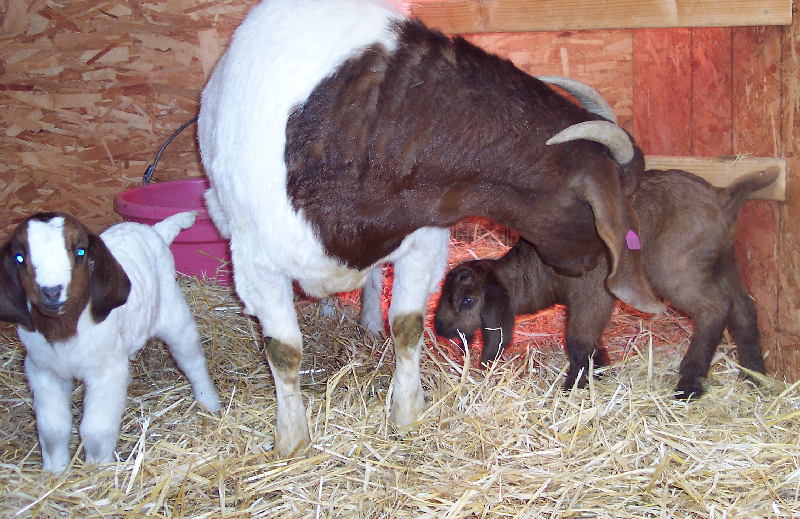 If you would like to be placed on our waiting list for 2019 Boer or Savanna goat kids or would like to reserve, please let us know. If you would like a buckling or doeling from a particular doe/buck, please let us know. Beautiful Boer Goats in Big Sky Montana!